The project was paused for Christmas and New Year, now I’m wondering whether to continue with the McWire design or go with something else. 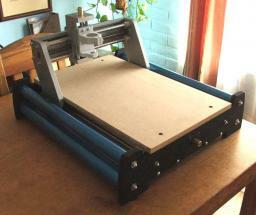 I recently came across the Fireball CNC machine, which looks very nice. Each machine is hand made in the US, which appeals to me. One of the early projects I wish to work on is a clock and I found some nice clocks with plans for sale. I contacted the designer and the largest part in the design I am interested in is a cog with a diameter of 11 1/2″. This is too big for the Fireball CNC machine. So, looking at the McWire design, in order to cut parts 12″ by 12″, the machine would need to have a footprint of at least 24″ x 24″. The design isn’t a compact one. So I am currently undecided what to do. Unless I find a design that really looks appealing I may continue with the McWire design. My recommendation for anyone wanting to build a CNC machine is to think carefully about how large the parts are that they want to make, then pick a design that fits that requirement. I’ve found what looks like a good source for bearings for the design. It’s Skate Bearings and they sell individually as well. Price seem very reasonable. If I can’t find a local skate shop then I will probably order from them. 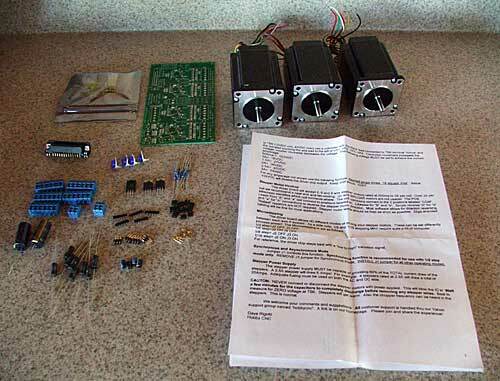 The Yahoo group for the HobbyCNC boards contains a file which describes a linear, unregulated 10A power supply, suitable for driving four motors. This power supply converts 120VAC to 34VDC up to 10A. The circuit diagram is very simple, but a lot of additional effort and parts are required to construct a working power supply. As you can see, the power supply sits in a box with the HobbyCNC board. Currently the lid is missing, as are the ventilation holes. Also the motors are simply connected to the board rather than via eight conductor cable that goes through holes in the side of the case. I am not going to reproduce a circuit diagram here because I don’t want the liability issues of publishing a circuit diagram that involves lethal voltages. If you own a HobbyCNC board then you can get the circuit diagram (and warnings) from the files section of the Yahoo group, otherwise you can find plenty of designs using Google. In general however the power supply should match the requirements of the control board you are using, and the vendor of the control board should be able to suggest a ready-made power supply or a circuit diagram for one. The power comes in to the board via a standard power cord and is connected through a 4A fuse to a rocker switch. After the rocker switch is the 10A transformer than produces 24VAC. This is then fed into a AC to DC converter board to produce 34VDC. The DC voltage then goes through a 10A fuse to the HobbyCNC board. The AC to DC board is made of stripboard (prototype board with copper strips), and contains the recitifer, capacitor and resistor. I wanted to make the construction modular so I used wire connectors to connect the various components (transformer, AC to DC board, fuses, switch, HobbyCNC board, power cord) together. This allows me to easily replace any component when needed. Still to do is the lid, an emergency stop switch and some ventilation holes. Not included: soldering iron, solder, shipping costs, taxes on local purchases. Note that the shipping cost for the transformer was $10.51. The total cost including taxes and shipping was probably closer to $85. A ready-made power supply can probably be purchased for $110 plus shipping, so perhaps it didn’t save very much. Missing from the list is the case. That is because I managed to salvage an old index card drawer and holder. I threw the drawer away and carved up the holder to make the case. This cost me $2 from World Care. A brand new plastic case will cost around $30 from Digi-key or Mouser. The cost of the power supply is not insignificant. 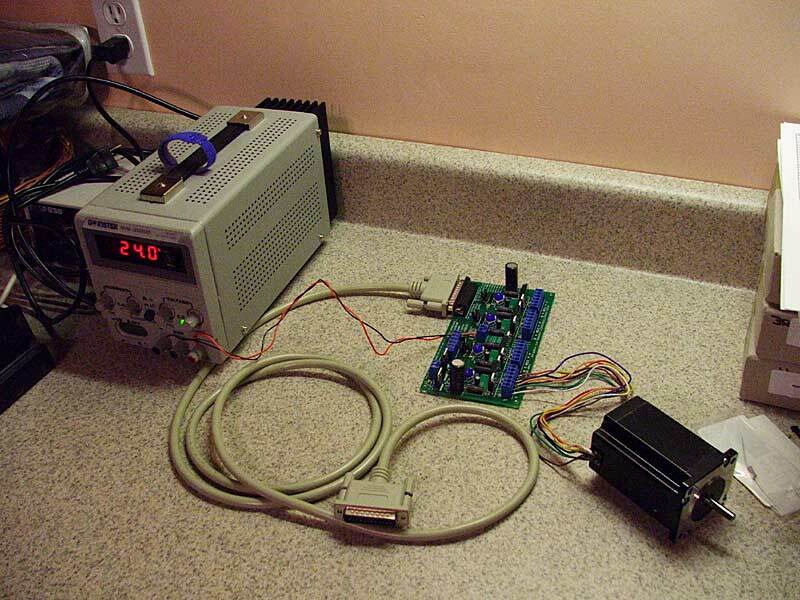 When people post low cost CNC designs they love to indicate how cheap the project is but omit important details like the power supply. 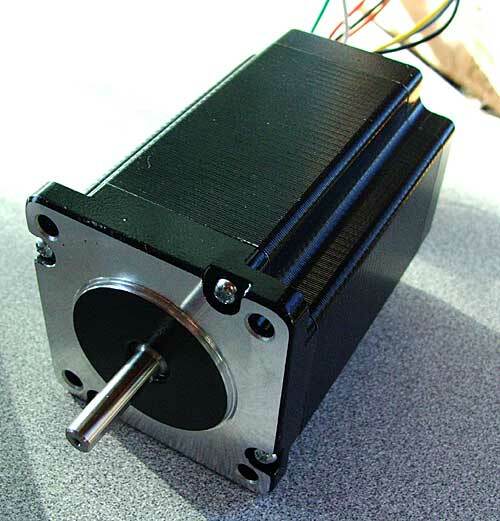 If you want motors with a good amount of torque then a good sized power supply is also required. My first test after assembling the board was to connect one motor to each axis in turn and test using Windows XP SP2 and Mach3. The test involved going to the motor tuning section and pressing the up and down arrows. On the X and Y axis it was clear that steps were being lost. I had to turn the settings down to the lowest speed and even then there was the occasional loss of a step. On the Z axis however the shaft only twitched. With identical settings to the X and Y axis it would not spin. So, the conclusion I drew was that there is a board problem with the Z axis. So the moral of the story is that if one axis behaves differently it could be Windows causing it and not the board. If you are stuck with Windows probably the only ways to determine where the problem lies are to either use a modified cable to swap pins around (so the problem axis is controlled by the pins for another axis) or to switch to TurboCNC and try that (perhaps with FreeDOS). I just completed the first test of running EMC2/LinuxCNC on Ubuntu with the HobbyCNC board. I connected a motor to the X-axis and started EMC2 with the “Axis” interface. I then told it to execute the default G-code file it loads with. Lo and behold the motor started spinning! I then moved the motor to the Y and Z axis and repeated. Seems to work well. Details on how to install EMC2 from source along with RTAI will follow when I have them ready. Also I will post the configuration files for the HobbyCNC board a bit further on in the project when I have more confidence that they are correct.